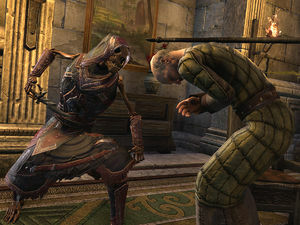 The preliminary looks of my necromancer, for the upcoming Elsweyr Chapter. 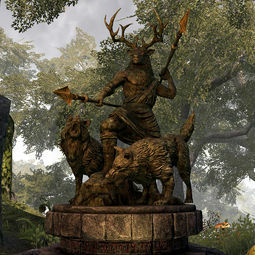 Current focus - ESO quests! The Empty Quests Category, we have ~40 quests to go (!!!) and most of them are in Stormhaven. My goal is to have this category empty before Elsweyr release. If the above is met faster, I will continue with filling in general information on quest pages: this will mainly be journal, quick walkthrough, other essential information, and stuff like choice outcomes, or other important information. Credit as much ONQP as possible, so that the project is kept alive. Document the quest choices, per a user request from UESPodcast. Future plan - pick out one ESO quest / place / other page to do a complete documentation on them. Would have to be something with enough significance. Already done a NPC, so this gets the lowest prio. Started with filling alot of gaps in Craglorn pages. 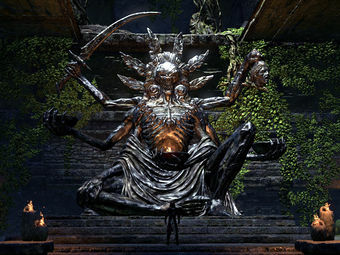 Then I focused mostly on DLC, and I've worked on every ESO DLC, from IC to Murkmire. I also add some vanilla content every now and then. Seems it might become my third FI?! This user has been on UESPWiki for 3 years, 4 months, and 5 days. This user has made a grand total of 9,187 edits in 1222 days. 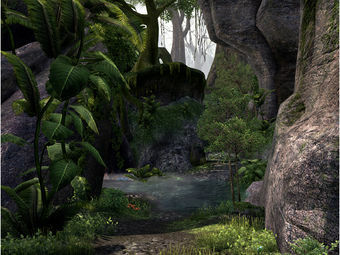 This user tried to play Morrowind, but the graphics made her eyes bleed. 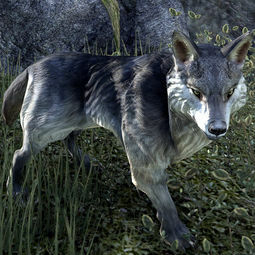 This user has played Oblivion. 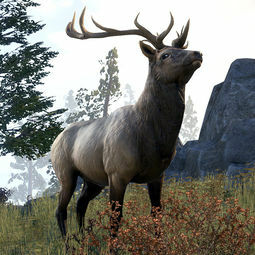 This user has played Skyrim. 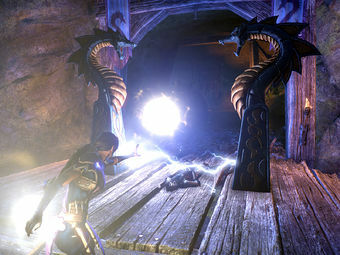 This user plays Elder Scrolls Online since beta. 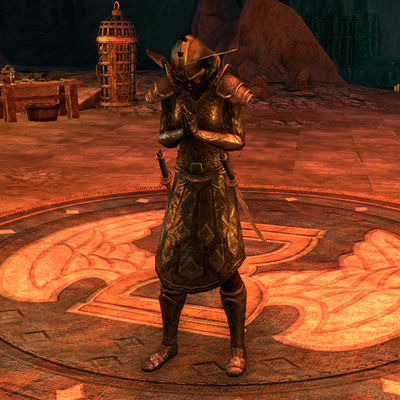 This user is in the Naughty Corner of the UESP ESO guild on the European PC server. 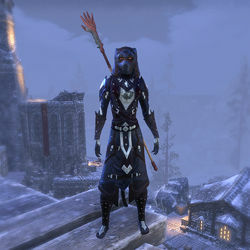 This user mains a magicka Khajiit NB, yet still beats you in this game. This user idles on UESP Discord 24/7 and is proud of it. 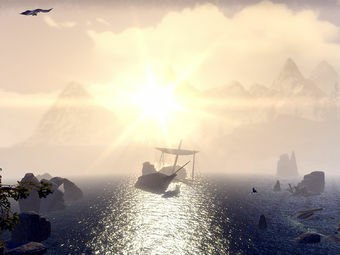 This user lives in Sweden, but can't seem to find the area on the map of Tamriel. "No, I'm their bard, but I lost my lute so I thought I'd improvise with a hammer and an axe. Of course I'm their blacksmith! Now go bother someone who likes to talk." You don't have to be so grumpy. "I'm not grumpy. I have a wonderfully sunny disposition. Now get lost before I accidentally hit you with my hammer. Twice." 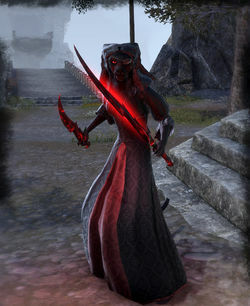 When you arrive to Shimmerene on Summerset, and help Raz fight back the yaghra monsters, some horrified citizens who witnessed the attack, will ask, "Are ... are those creatures ... newcomers? They're hideous!" 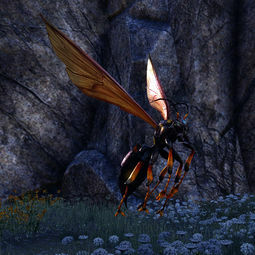 When you talk to Raz and ask him what the connection is between Queen's decree and the spawning Abyssal Geysers and yaghra monsters, he gets carried away for a moment: "Nothing at all. 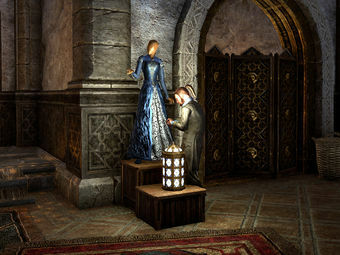 Unless you think they came to Summerset because of the Queen's decree? No, that would be ridiculous. Let's not lose focus." 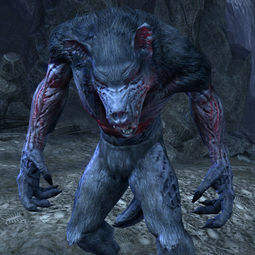 Hjurring - another wonderfully grumpy chracter, it probably comes with the job (overseeing the Hall of Dead in Windhelm) - "Fine. I get it. You saved some drunks and got the dead to settle down. You're a big hero. Blah blah blah. Now, will you please leave? The only reason I took this job is because I can't stand the living." 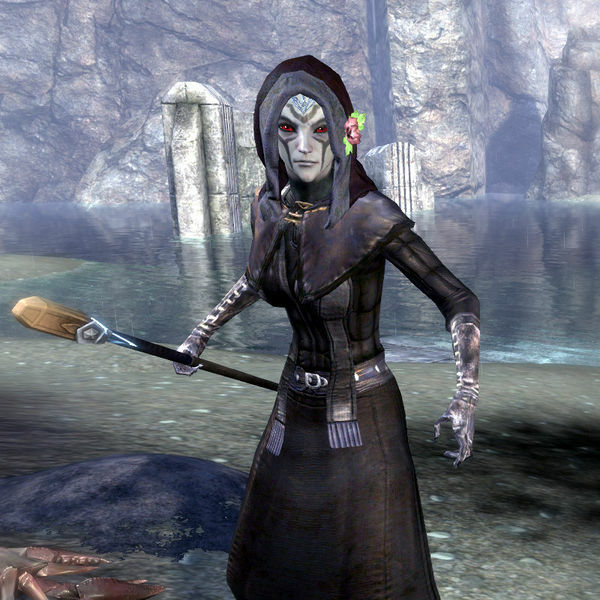 Safa al-Satakalaam, a proud Satakal priestess - "I am no cultist! You make it sound as though I am some kind of skooma-addled peasant shouting about the end of days." 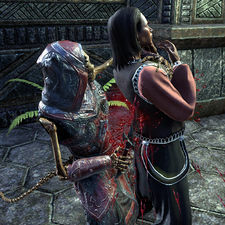 Corentin Clavarie, a heartless Breton refusing to help an Argonian in need - "You want to cry me a river? Go ahead. 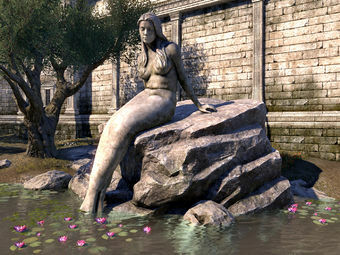 Maybe you can float out of Craglorn." 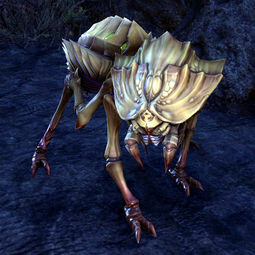 Silver-Claw upon me sneaking into Velsa's garden - "Are you some sort of ... freelance gardener? The first I have met! A most effective entrance." Pekai-Jee. Don't eat the food. Meredil the Archivist, "outwardly prudish but secretly lustful" librarian. "Hello ... you! Good to see another Undaunted. I've been drinking my way through all the places Undaunted dwell. "In the morning, I'll be sober, but you'll still be stupid." "Ha! You won't be sober in the mornin'." 1 - Tracking all possible things, haven't used it some time now though. 2 - Gonna use it for writing bigger pages or lore. "Turn back, Venom! I don't want to kill you!" "I will not beg mercy from the likes of you." After finishing this quest line, I don't really feel satisfied at all. Simply because I don't actually care about Artorius although he is the de facto antagonist in this little power struggle on the Gold Coast. It is the Black Dragon who steals the spotlight in this story. 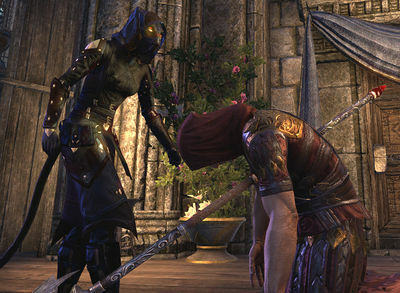 Her character is, for me, one of the most interesting ones in ESO. She is broken, and she is suffering as she tries to hold on to the last thing reminding her of her humanity (Green-Venom-Tongue). You can only imagine what it feels like to lead a life like hers. (Well, not only imagine, since you'll be given a glimpse of the events that made her who she is) I REALLY wish we had a couple of choices in the end, when you hunt her down in Knightsgrave. Her fate really makes you wonder about the relativeness in good vs evil. Which was likely the whole point when the Brotherhood content was designed. This quest line is really cool, spot on with the theme if you ask me :) I'm also completely sober writing this *nods*. "And here we are. I'm ready to die. Let's see if you're good enough to kill me." "And who do I have the pleasure of being saved by? ", the obviously relieved traveller asked, trying to ignore the rescuer's unconventional clothing, including a prominent cleavage. 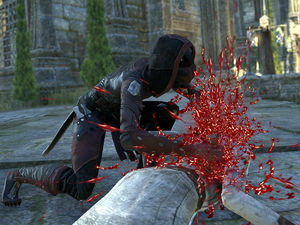 The Breton carefully wiped off Daedra blood from her iron sword, and turned around to measure the traveller. This is a rather good-looking male body, she concluded. Let's hope he wants to buy me a drink. "Mabrel Squatpump-Titball, at your service," she smiled. The traveller was just about to offer to buy her a drink at the nearby inn, when he was given a very nonchalant staggering nudge from behind. "Hey! What is this—" he choked on his words, staring into a pair of glowing red eyes. Mabrel snickered softly. "Careful around Nightfur. He can be very protective at times." "I didn't ask for any of this! And what's up with that stupid dress?" Something was simply not right. 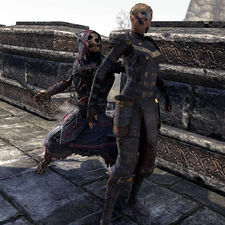 Tibbie, the sixteenth-fold veteran of Aldmeri Dominion, Slayer of Undead, Savior of the Nirn, Maelstrom Arena Champion, and the secret love interest of Razum-dar (let's not talk more about that) was now sure she'd somehow contracted Witbane, Ash Woe Blight or some other horrible disease. She could not explain why one day she started to act strangely, going to the places she had no plans to visit and stopping for long moments to stare at creatures she would otherwise simply hack and slash or pass by without as much as a shrug. Or buildings. Boring, tall, stone bricks, wood, cobwebs, skeletons and all that. 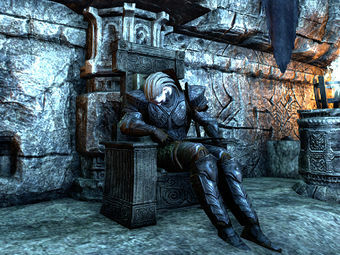 Truthfully, she got a headache after staring at some insignificant Dwemer ruin for what seemed like an eternity. 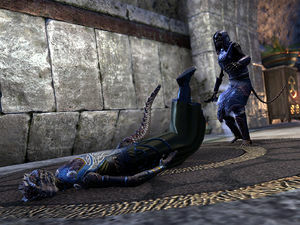 It was as if almost somebody else controlled her Khajiit body, forced it to stop, sneak, climb or do other (potentially embarrassing) things. If she didn't know better she'd think somebody was remotely using her for gathering information about her surroundings - the places, the people, the nature, the dangerous creatures. There could only be one explanation. Yes, that was it! Tibbie had heard rumors of the fellow adventurers across all factions who were believed to be chosen by an unknown scholar cult from a parallel dimension to gather information about her home world. 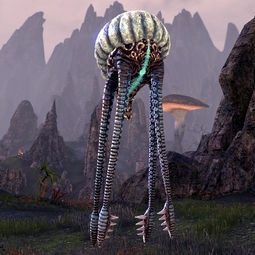 Every piece of information, every creature, building and plant would be thoroughly assigned and evaluated by those Breton-like pale figures, who would spend hours sitting behind their advanced digital calculating machines, describing and discussing Tamriel, if not the whole Nirn itself. Why on earth anyone would waste their time on this was beyond the Khajiit's comprehension. 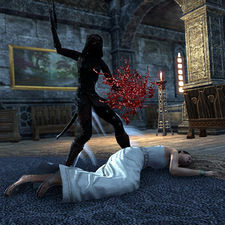 She only knew she was chosen and she had to accept her fate. 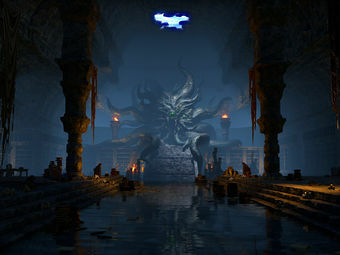 Ahem... on to those damned catacombs of Skyreach then! she sighed. Good research doesn't just come knocking at your door, after all. 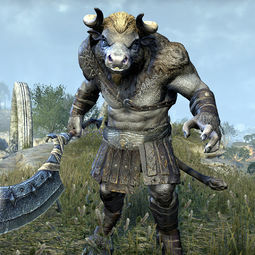 We wouldn't want the world - err, the other worlds - to get some wrong ideas about Tamriel anyhow. She gazed upon the stars as if waiting for a response. There was only silence. These bloody scholars - Wikians, or whatever they now were called. 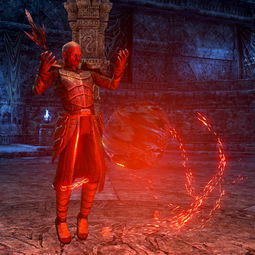 I started to edit here in December 2015 when I noticed there are some Orsinium Contraband items not listed on the page yet. 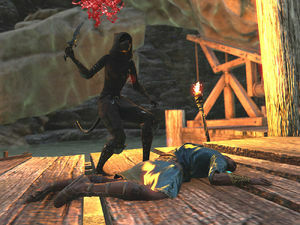 Shortly thereafter I went to explore the Craglorn Adventure Zone because I was busy with other things (PvP!) when the zone was added in 2014, plus I had a rather long break from the game as well. I noticed how many things still needed to be added and started doing it. 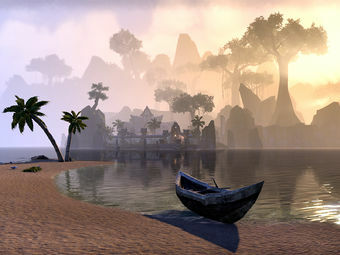 I have now worked mostly on one area at a time, in the order of Craglorn, Thieves Guild, Dark Brotherhood, also a little bit of Orsinium and a few other things. 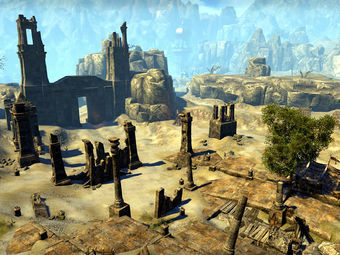 Shadows of the Hist is such a small DLC, so not much to do there, but I'm really looking forward to the Q4 update, and hoping we will get more content then :) If it's Vvardenfell, it's gonna be quite a trouble though, because I know little about this region. About 65% of my contributions are to the Online pages, and about 25% are Online image uploads, the percentages have been quite constant. A little list of what I've been working on here so far! I focus on a specific location where I add big chunks of information and I get obsessed at discovering every piece of relevant information. 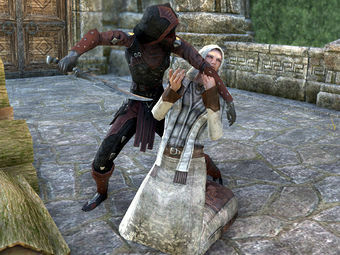 All things Thieves Guild - pre-release, and probably keep adding things after release also. 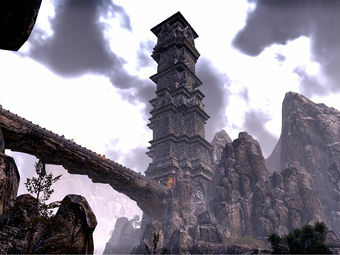 The Craglorn related articles, aka more qualitative work, but I need to look through lots of sources in order to conclude well, anything about this region. It's a bit overwhelming. For example it's quite hard to describe how the region is split up between the different groups, although it is clear that it's the case (Iron Orcs to the north, Blackcaster mages in southeast and Anka-Ra to southwest). Plus I don't know which sources are acceptable (npc conversations, lore books, events in game...) :/ There's lots of err, lore, which is quite specific to Craglorn and not found elsewhere. This means Craglorn articles would rely on almost solely primary sources. Shuryard became "Shurgard". 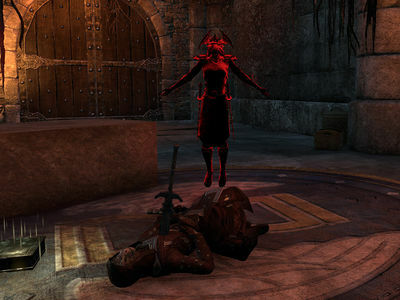 Should she return to UESP I'll make sure to apologize for that. Lazy Murshez turned into Lady Murshez. What the...? This page was last modified on 25 March 2019, at 12:44.